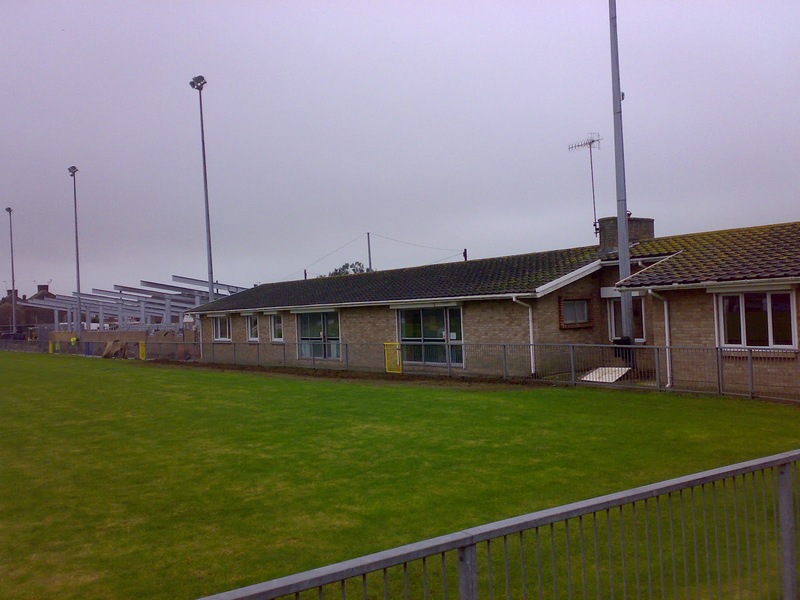 Lancing FC is a non-league football club from the town of the same name on the West Sussex coast who were formed as Lancing Athletic FC in 1941 playing at Crowshaw Recreation Ground, going on to join the Brighton, Hove & District League in 1946. 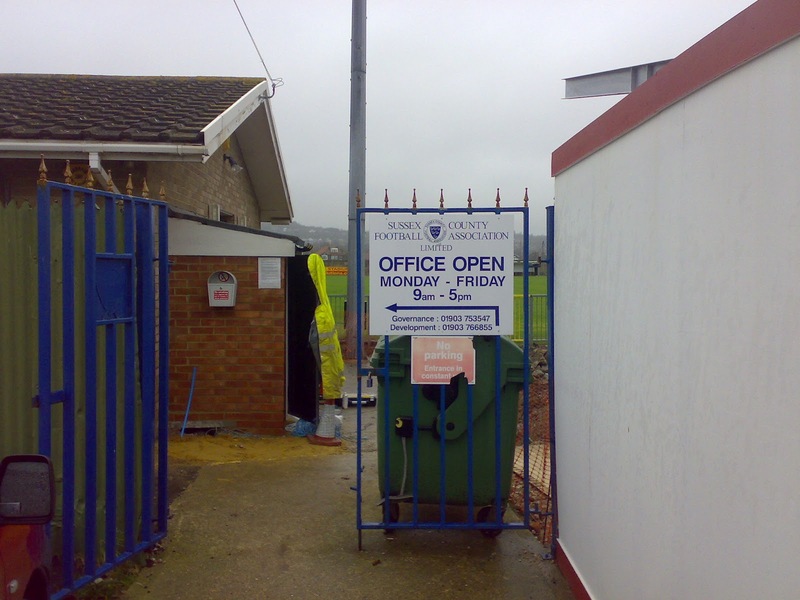 The team went on to win the league and cup double in their inaugural season, but the club were rejected when applying to join the Sussex County League. The league title was retained in 1947–48 at which point they were accepted to the county league. ‘The Lancers’ finished as league runners-up in 1949-50 before moving to a new ground at Culver Road in 1952. The team finished bottom of the table and were relegated to Division Two of the Sussex County League in 1956-57, at which point they dropped ‘Athletic’ from their title. The change appeared to pay dividends as they were promoted to the top flight at the first attempt. However, a further relegation came in 1967-68, before the Division Two title and promotion was secured in 1969-70. The 1971-72 campaign saw Lancing drop back down to Division Two, where they would remain for eleven years. 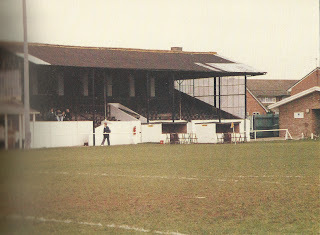 The club sold Culver Road to the Sussex FA in 1981, becoming tenants of the venue as floodlights were installed. Promotion to Division One was won in 1982-83 before going back down at the conclusion of the 1989-90 season. It would take until 1999-00 before Lancing regained their Division One place, but their spell lasted just one season. In 2010-11 a Division Two runners-up place was enough to win promotion back to Division One. 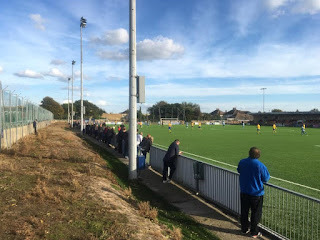 In 2015 the Sussex County League was renamed the Southern Combination, with the Lancers being placed in the top flight Premier Division under manager Ash Bailey. Bailey was replaced by John Sharman in October 2016, taking the team to a couple of mid table finishes before Ash Bailey returned in May 2018. However, his second spell was to last just a couple of months before he resigned to the replaced by Mark Pulling as player manager in August 2018. Lancing FC will play in the Southern Combination Premier Division in the 2018-19 season. I was in West Sussex visiting football grounds by train for the day, enjoying my time out of the capital. I had called in at Southwick FC and Shoreham FC before alighting at Lancing. After a short walk I found myself outside the part building sight that was the Culver Road home of the club. My research had been lacking and I didn't realise that the aesthetically pleasing old Main Stand had gone or that the grounds owners were the Sussex FA. The good news was that there were administrative staff in the offices, so I could go and ask for permission to pop inside the ground to take my photos. Thankfully they had a sensible view to the over the top health and safety rules and said it was fine as long as I was careful around the area where the new stand was being erected. 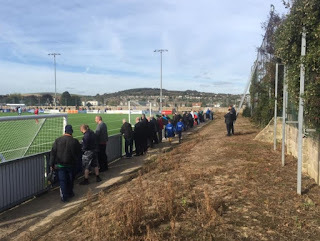 Culver Road appeared to be a very neat and orderly venue, despite the lack of a stand. The pitch was surrounded by a new fence with hard standing and then grass at the other side of it. 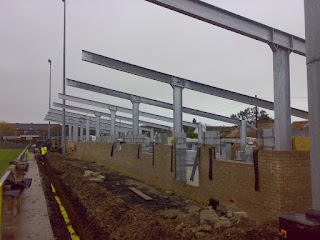 The dug outs were opposite where the stand was being built. The stand had the Sussex FA buildings next to it. I departed and thankfully for me, caught the next train to Worthing with a few minutes to spare. 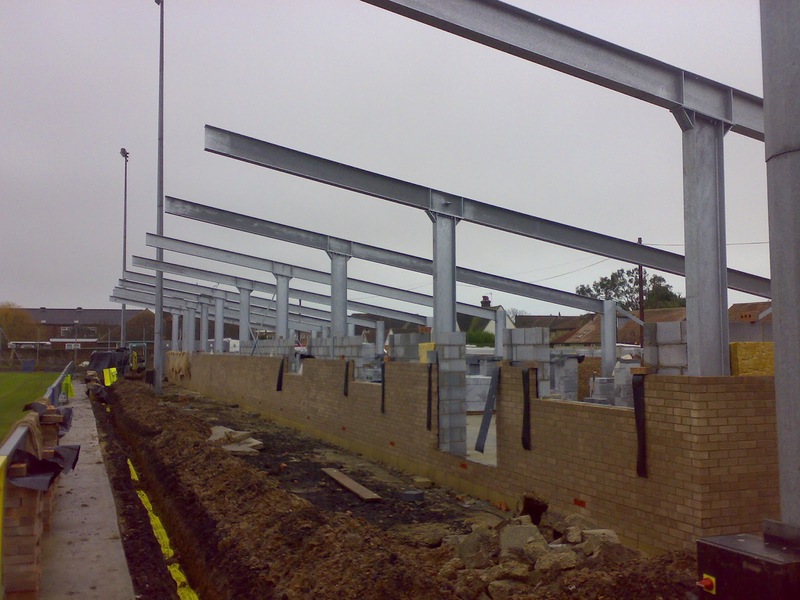 I was impressed by the friendly and helpful welcome at Lancing and wanted to return in the future when the new stand had been completed. It would take far longer than intended to return to Culver Road, and when I did it came in slightly unusual circumstances. 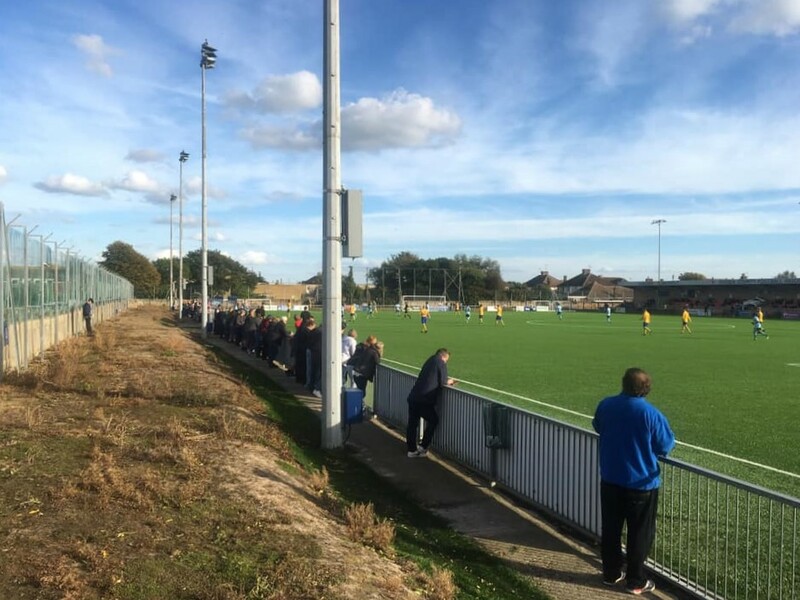 Lancing had been knocked out of the FA Cup in the previous round, but their opponents Phoenix Sports had fielded an ineligible player. Consequently, the Kent side were chucked out and the Lancers given a reprieve. The weekend had seen action in the next round, but we were playing catch up thanks to a brave batting performance by today’s hosts the previous Tuesday. 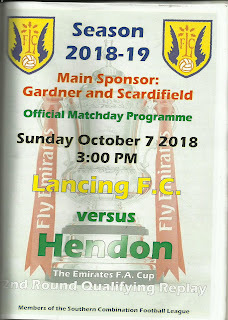 Hendon had the vast majority of possession and chances at Silver Jubilee Park, but a goal from Jack Langford grabbed a draw for the underdogs. Indeed, they very nearly snatched it at the death but for a fine save from Dons keeper Dan Boness to deny Matt Daniel. Make no mistake. Lancing deserved a second go because of their excellent defending. We had a feeling in the bar that Greens manager Jimmy Gray may have offered some strong feedback to his charges. Steve Barnes was up for the journey to the coast with me on the train, despite engineering works between Three Bridges and Brighton meaning a rail replacement bus service been in operation. However, my pal had a Plan B. We met at 9.30 at Kingsbury station on a beautiful day. Saturday had been absolutely foul and I got drenched and cold on my visit to Brightlingsea Regent v Torquay United. So much so that I stayed in and had a sensible evening. That meant that I was raring to go the next day, as I headed out early for a Wetherspoons brekkie and to study the Non League Paper ahead of Steve. We alighted from the tube at West Hampstead to head across to the Thameslink station. My return ticket was an acceptable £16.10 with my Network Railcard. We caught the service to East Croydon from where we waited and caught a train towards Brighton, via Littlehampton, giving us some stunning views of Arundel Castle across the River Arun. Unfortunately, the works on the line meant that we arrived twenty minutes late into Littlehampton. This was a bit of an inconvenience but no real drama. However, we were not happy when it was announced that the train would continue to Brighton without further stops. I should have been a little more sympathetic as a railway employee, but I couldn’t believe the decision. Trains only ran every hour, so we were to be inconvenienced. I offered my thoughts on the matter to the Southern Rail staff, who were in agreement. There was nothing else for it. We walked along the side of the railway and into the Steam Packet for a cracking pint of Lawless from Franklin Brewery. Calmed, we returned and I apologised to the bloke on the platform where we enjoyed a laugh. Our next port of call was Worthing. I’d bumped into fellow groundhopper Luke Williams at Haringey Borough the previous Monday who was from the town. It prompted me to ask him for pub advice along that neck of the woods. Decent pints were enjoyed in the Brooksteed Ale House, a micropub near to the Woodside Road home of Worthing FC and then the Castle Ale House at the other side of the station. Both establishments offered free cheese and biscuits which was a nice touch. We had time for a quick pint of average Arundel Ale in The Grand Victorian Hotel opposite the station. While the beer wasn’t anything to write home about, the magnificent ornate décor most certainly was. It was just one stop to Lancing, from where it was a further five minute walk to the ground. My SJP car park colleague Gerry Maguire had secured me a programme in advance, so there was just the £8 admission to take care of. Culver Road had been smartened up and completed since my previous call. The fine stand had plenty of seats and a covered standing area. 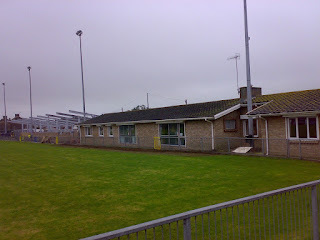 A new artificial pitch had been installed, which was getting plenty of usage as Horsham FC were in temporary residence. It was because of their tenancy that the game had been shoved back a day, as the Hornets had taken on and defeated Kempston Rovers twenty four hours previously. A large crowd had assembled for the Sunday fare, including plenty of neutrals. Manager Gray brought Marvin Morgan in along with three other changes to the Dons starting line up, and the visitors played with a more intense attitude than the previous Tuesday from the off. Early pressure was to pay off on thirteen minutes when a Lee Chappell corner eventually fell to Stephane Ngamvoulou who smashed past the goalkeeping hero of the first game Tyler D'Cruz from seven yards. Jack Langford continued to run his heart out up front for Lancing, but he was offered little support. He got one shot away that was comfortably saved by Boness. Cole Brown forced a fine stop from D’Cruz at the other end. The lead was to double on the half hour mark when a Howie Hall cross was adjudged to have been handled by defender Adam Willard. Referee Ian Fissenden pointed straight to the spot and there were not too many arguments, which told its own story. Ricky German slotted away the spot kick with his usual aplomb. The big striker was causing frustration among some fans and team mates as he seemed to be holding onto the ball longer than necessary. He had two weak shots when colleagues were better placed to add to the feeling. Shaquille Hippolyte-Patrick set up German who forced D’Cruz into another top stop just before the interval where Steve and I headed into the crowded bar to share a bottle of London Pride to wash down the cheeseburger I’d earlier sampled. Some of the home fans thought their favourites had puled a goal back when player manager Pulling sent in Langford, but the striker saw his shot go into the side netting within the first minute of the restart. Morgan was replaced by Gianni Crichlow shortly after. He was soon into the action when Laste Dombaxe passed to him to glide past Alex Bygraves and get his shot away. D’Cruz couldn’t get enough on the ball to prevent it going in off the post. Both sides made subs with the game more or less done and dusted. Langford forced Boness into a good save with his legs as the front man continued to impress and earn respect from the visiting support. The score was extended on seventy minutes as Hippolyte-Patrick and Brown played a brilliant one two for the former to take a touch and put the ball away. It was a delightful goal that drew applause from all in the stand. Brown was denied another couple of times by D’Cruz, while Boness showed his quality at the other end in the dying embers by saving from Jack Webber and then Daniel from the resulting corner. The performance from Hendon put right many wrongs from the first game. 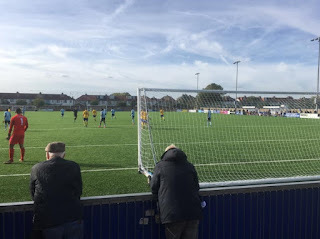 They were professional and clinical, though Lancing deserved much credit for playing the game properly and never stopping until the final whistle. They were through and £15,000 better off. 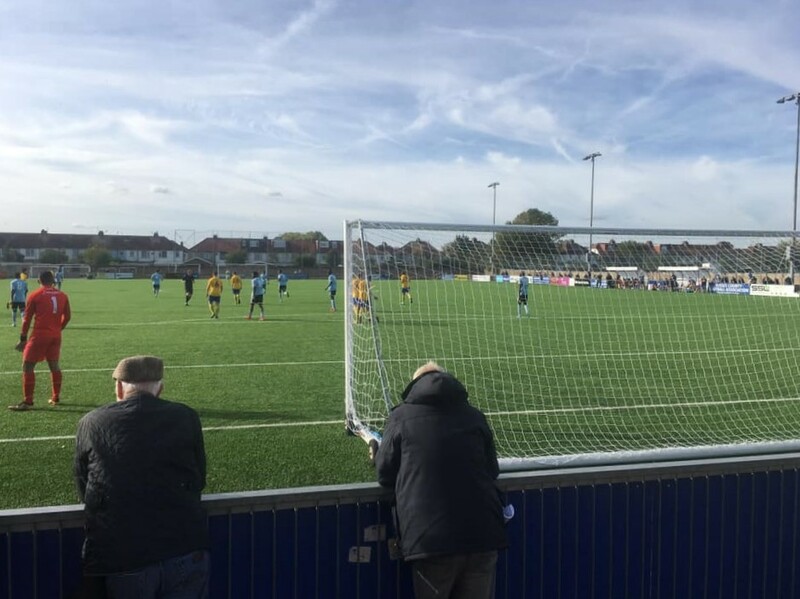 Because of the backlog of fixtures and the replay Hendon faced a trek to Chippenham Town in the third qualifying round the following Wednesday. Words like that made me even prouder to lend my support to Hendon. I hope and I’m sure that they were just as gracious in victory. It also ensured that Lancing would hold fond memories to Dons fans. Incidentally, the programme was a cracker. Thick with lots of reading, information and statistics with minimal adverts. There was even a sudoku and word puzzle! Some other non-league clubs could do well to take note. My mate Luke had told me that The Stanley Ale House was the best micropub that he’d visited. Even better it was just 400 yards from the ground. We were immediately impressed with its set up in a building that was formerly a laundrette. 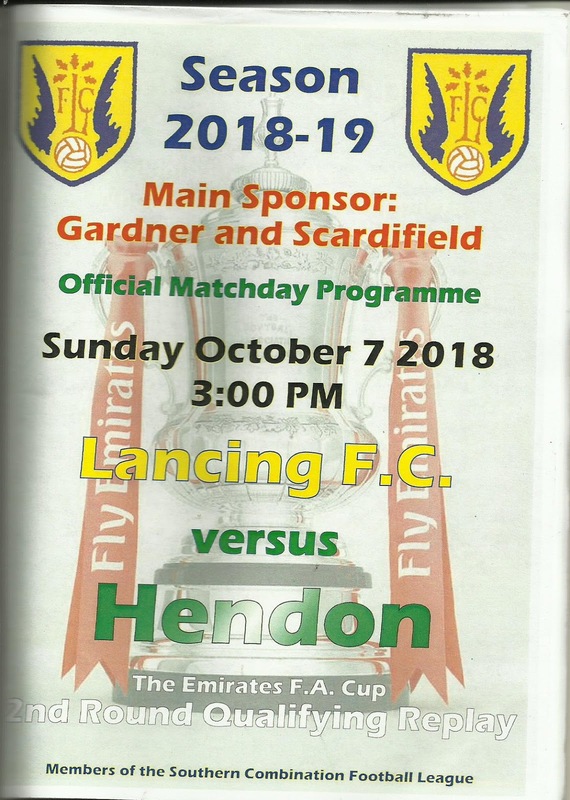 We were served by a friendly and knowledgeable Lewes FC fan who commented that he was disappointed with Hendon’s placement in the Southern League. He wasn’t alone there, as many of us dreamed of a long day out in Lewes! The beer was brilliant, but singer Karl playing covers on his electric guitar was the real star. He did stuff from the Beatles and before to Pink Floyd and right up to Stereophonics and Oasis. It was just perfect after an away win. After a couple of pints, we took a train along to the familiar territory of the Duke of Wellington in Shoreham. If we thought he captivated the audience, we were in for a treat in the packed Duke of Wellington in Shoreham where an Americana/country band brought the house down. Porchlight Smoker were certainly popular. Two pints later we agreed on a couple in a strangely quiet Evening Star in Brighton. I mean travelling through the city and not calling in is like a trip to Rome without the Vatican or Coliseum. I gather we got a replacement bus to Three Bridges and then train to West Hampstead. I was in a tired and emotional state by the time I got home at midnight, especially as the reality of just five hours kip kicked in before my next adventure as I headed to Belfast for the Big Two Derby.